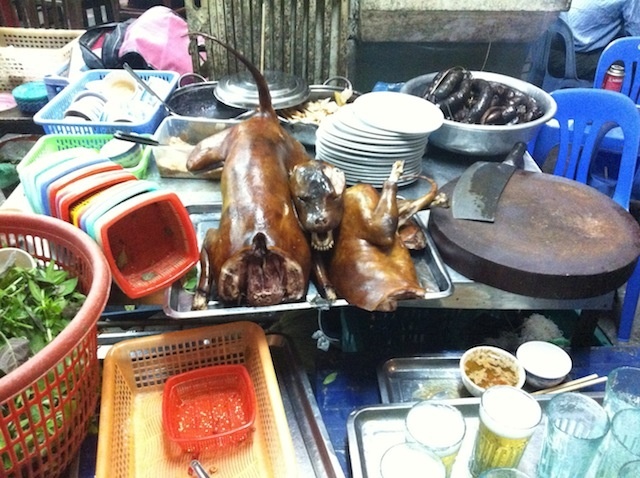 Thịt chó ( dog meat ), just simply food or something else? Fullmoon so it is, the last fullmoon of lunar calendar 2013. As an old habbit, the large majority of Vietnamese people are now looking for a dog-meat restaurant to either enjoy this kind of special and nutritious food or to committ in some supertitous belief that helps to blow away all their bad lucks. So what is it? What’s really behind the dog-meat story? Travelers to Vietnam are always astonished by seeing the the dog meat to be displayed in market malls, sometimes still in good shape, sometimes are well chopped and placed in the table of the dining area. More often a case, they turn into frustrated and curious as why this kind of very exotic food to be available in a friendly country of Vietnam. Why these local people treat their pet badly?, how can they kill and eat their own little dog? on and on… Let me clarify with you right away that Vietnamese people don’t eat their own dogs. They do eat, but just the dogs that raised in the farm or from some unknown sources and to be supplied to the restaurant. Unlike other part of Asia like China and South Korea, where dog meat is part of the regular food choices, Vietnamese people eat the dog with a hope for luck to be around soon ( second half of the lunar month ) and to clean up totally any bad luck they might have commited during the last moon ( first half of the lunar month ). That’s the reason why dog-meat restaurants rarely open before the moon is full as chance for the diners to walk in the first half of the month is very limted. Culturally speaking, this must have been an aged-old customs and this habbit/practice just being handed down from generation to generations. Do you think it is a good custom to keep or not? I have not been eating the dog meat for several years and will not have any excuse to try it again in the future. So do a lot of my friends or people I know. It shows a good signal of a more integreted and civilized thinking of the new Vietnamese generation. There should be no reason to blame bad luck or good luck by eating the dogs, decision is yours, guys!